These GO To Wines from E&J Gallo Winery are the answer to your most frequently asked wine question: Which wine to choose? I am often asked for wine advice. I like to think it’s the result of all the wine-tasting I’ve done professionally over the years. I suspect it’s more likely because I like wine, a lot. My approach to wine is simple: you either like it or you don’t. Pick the one you like, and enjoy it with friends. Yes, I know wine can be complicated and knowing which wine to choose can be daunting. ^ “I want to keep wine on hand for last-minute entertaining at home. What should I buy? What are GO To Wines? ^ Wines consistently good from year to year, so you don’t have to worry about vintages and reviews. ^ Wines which will satisfy a variety of palates – from your friend who orders wine by color – “I’ll have the red” – to your friend who has an annual subscription to Wine Spectator (I love you both). 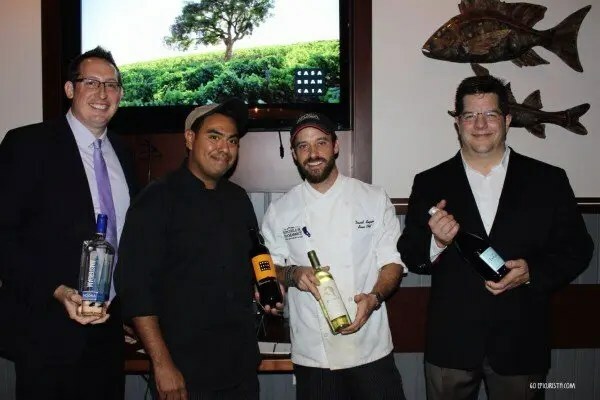 I recently enjoyed Mitchell’s Fish Market of Winter Park #ItalyUncorked Wine Dinner, which I reviewed for City Surfing Orlando. It was a fantastic event of great food, wine and conversation. The wines we tasted from the E&J Gallo Winery portfolio are a perfect addition to my GO To Wines list. Try them next time you see them on the menu or store shelf. You may find a spot for them on your GO To Wines list. Prosecco is mostly thought of as an inexpensive, light, sparkling wine, often used to make mimosas. Yet, it can be very versatile. Not just for sipping casually, but also for food pairings. La Marca Prosecco, one of my favorites, shows more substance than many Proseccos, which I find can be simple and uninteresting. You may pay a bit more for it, but trust me, the extra few dollars are worth it. This sparkling wine from Treviso, the Veneto region in Northern Italy, has a pleasant floral aroma with fresh citrus and honey. Serve it in a regular wine glass, instead of a flute, so you can take in those beautiful scents. Crisp, clean flavors of citrus mixed with baked apples. A hint of sweetness balanced with crisp dry notes, makes it very versatile. If you forget the name, think of this elegant GO To Wine as the one with the Tiffany-blue label. 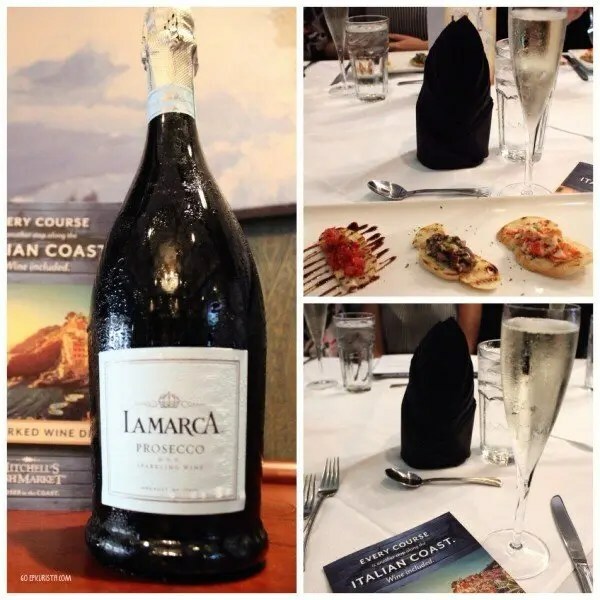 La Marca Prosecco Food Pairing ideas: Sushi, Asian dishes, shellfish, stuffed mushrooms, cheeses, and of course, brunch! Hailing from the Tuscan hillside town of Vinci – as in Leonardo’s historic hometown – this crisp Pinot Grigio is produced by Cantine Leonardo Da Vinci, a group of 200 passionate local winegrowers. Da Vinci Pinot Grigio shows delicate floral aromas and flavors of ripe tropical fruit and citrus. Not your typical inexpensive Pinot Grigio, this GO To Wine shows a creamy soft mouthfeel, lots of character and lively acidity that will stand up to a variety of foods. The pairing with the Butternut Squash Tortellaci was my favorite of the night and showed perfect balance. It is Epicurista heaven when the wine makes you want to take another bite, and the food makes you want to take another sip, and you never want it to end. I wish I had another plate of that Butternut Squash Tortellaci as I write this! I was happy to hear it will be featured on the Mitchell’s Fish Market menu this fall. 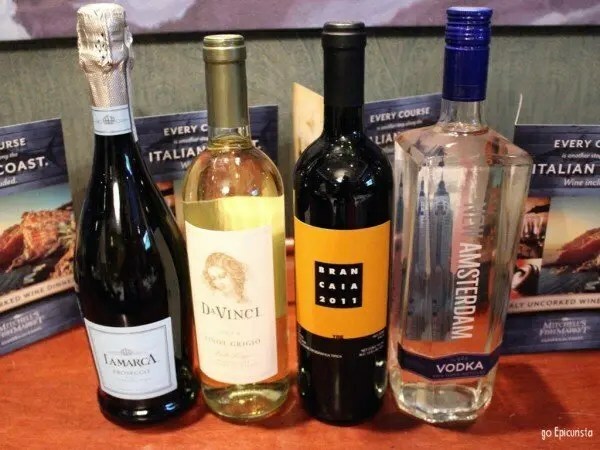 Da Vinci Pinot Grigio Food Pairing ideas: Angel hair aglio e olio, linguine & clams, roasted chicken, Panko-crusted tilapia (or any flaky white fish) & goat cheese salad. 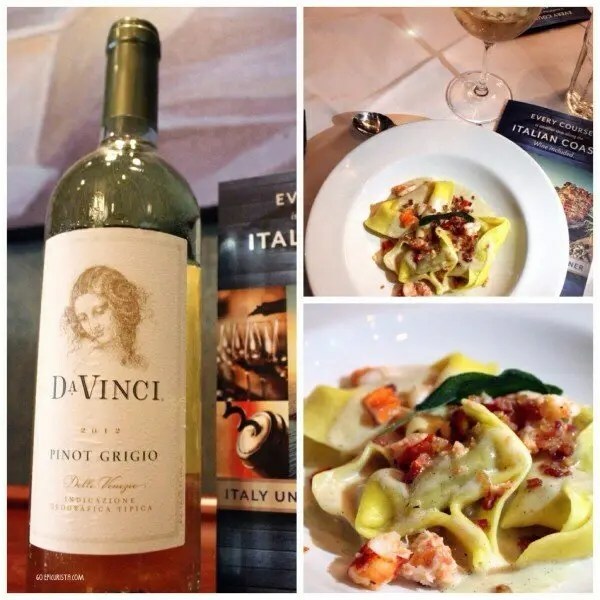 Da Vinci Pinot Grigio with Butternut Squash Tortellaci was an amazing pairing! Brancaia “Tre” Red Blend is named for three Brancaia estate vineyards in Tuscany – Brancaia Estate, Poppi Vineyard and Brancaia in Maremma – and the three most acclaimed grape varieties in the region – Sangiovese, Merlot and Cabernet Sauvignon, which come together in this bottle. With beautiful deep ruby color, aromas and flavors of fresh red berries, this Super-Tuscan wine was elegant and well-balanced. The wine is 80% Sangiovese, with a delicate medium body, proved you can pair white fish with a red wine. 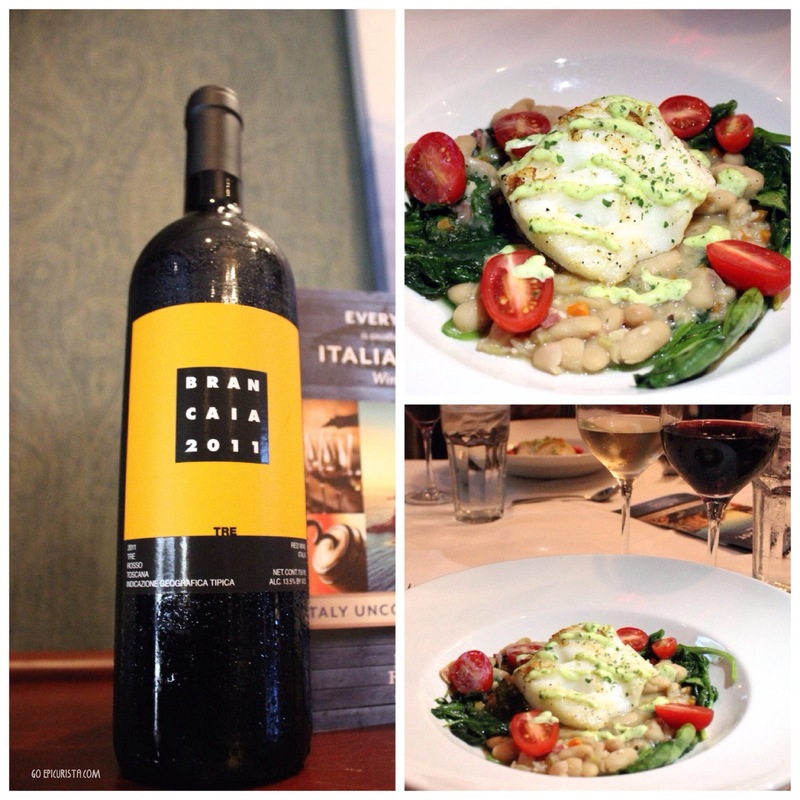 The Pan Roasted Sea Bass with cannellini beans, spinach, tomato and basil aioli was full of flavor that paired well with this GO To Wine red blend. Brancaia “Tre” Red Blend Food Pairing ideas: Roasted chicken, pastas with fresh tomato sauce, grilled fish. Not a GO To wines pairing, however, keeping a bottle of vodka on hand for Easy Entertaining cocktails is always recommended. 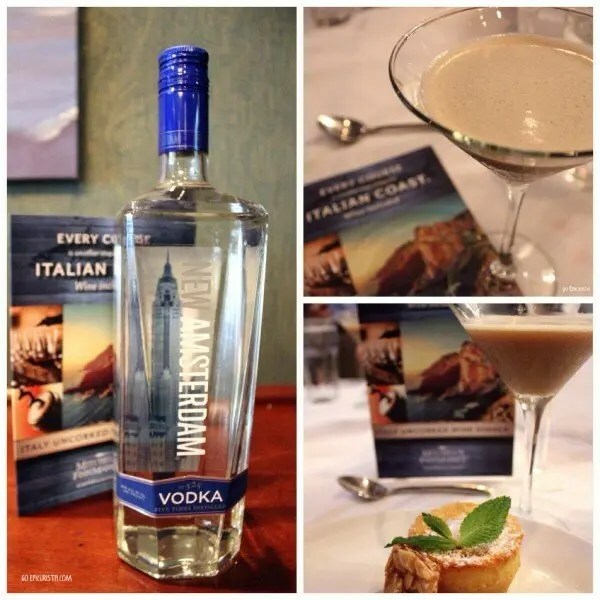 New Amsterdam Vodka, inspired by New York City, is five times distilled making it very smooth and filtered three times for a clean, crisp finish. It was used perfectly in the Italian Espresso Martini. Paired with the Almond Cake with Mocha Anglaise sauce was the perfect way to end this delicious journey of Italy. Certainly a lot more fun than having a boring cup of coffee. The recipe is coming up next on the blog. Here’s a tip: if your favorite wine store or restaurant doesn’t carry these GO To Wines, ask them to bring them in. Chances are, they will. What wines are on your GO To Wines list? Please share in the comments below. I totally agree! La Marca is the perfect balance. Try it in a bellini, so good! Thanks for stopping by the blog Denise! Cheers!